How to grow chamomile in your garden and have an endless supply of this amazing herb! I think it is a beautiful flower that adds a touch of whimsy to your vegetable or herb garden. But chamomile is an awesome medicinal herb that can be use in infusions, tinctures and as part of salves that have wonderful health benefits. If that wasn’t enough, chamomile is a great companion plant as well. Chamomile can actually help other plants and herbs to increase oil; making them smell more and taste better. It is a great companion to other herbs, beans, broccoli, Brussels sprouts, cabbage, cauliflower, cucumbers, and kale. There are 2 types of chamomile: Roman and German chamomile. Roman chamomile (also often referred to as English chamomile) is the most common and “true” chamomile. Roman chamomile grows like a ground cover where German chamomile can grow up to 2 feet in height. Roman chamomile is a perennial where German chamomile is an annual. They are both used in nearly identical ways as herbs. 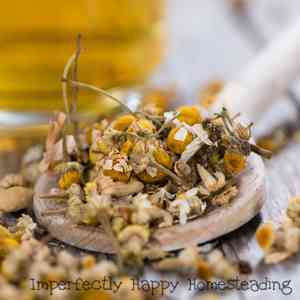 Chamomile has been used throughout the ages for a myriad of health benefits. It can be used both internally and externally. Widely known as a tea for relaxation and an aid to insomnia; chamomile can also be used for colds, fevers, digestion issues, menstrual cramps. In oil, ointments and salves, chamomile can help abscesses, wound and rashes. Chamomile seeds need light to germinate so you’ll want to spread them out in the area you wish to use and tap them slightly. You do not want to cover these seeds with soil. Germination can take up to 14 days. Because the seeds need light, you may want to start in them indoors to avoid the seeds being eaten by birds. Just make sure you start your seeds in a warm, sunny area. You can then harden off your plants and transplant them into your garden. German chamomile is best in larger garden areas or raised bed but Roman chamomile can do well in containers or pots. Give your transplants 6 – 8 inches of space between other plants. The plant prefers soil that drains well and in full sun. You’ll find that chamomile does best when it is left alone to grow. Chamomile is not a heavy feed so be careful not to over-fertilize your plant – it will actually weaken it. Chamomile, under the right conditions, is very hearty and pest resistant. But be sure to keep an out out aphids and mealy bugs. Once your chamomile is established and blooming, you’ll want to begin harvest the flowers. You can usually harvest a few daily. 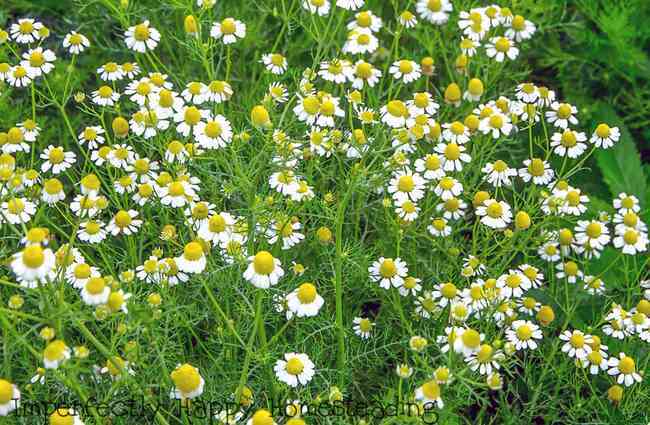 You’ll want to harvest your flowers when the are fully open but before the petals begin to drop back; that is when chamomile is at its peak. It is recommended to pick the blossoms in the morning by simply pinching the stalk, right under the flower; you do not want the steam or roots of this herb. Once you have harvested your flowers you can dehydrate them in a dehydrator, on the lowest setting for at least 12 hours. Alternatively you can spread out the flowers and put them in a warm dry area to slower dry; this can take several weeks. Once completely dried you’ll want to store your herbs in a cool, dry, area. I use a mason jar to store my herbs in my herb closet. They should keep for up to 6 months, under the right conditions.